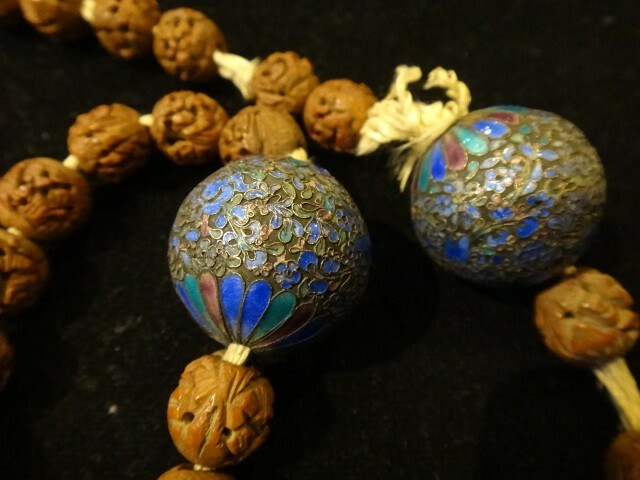 A Google search on this topic will reveal many examples of the necklace that Qing Dynasty officials were obliged to wear as part of their formal dress. 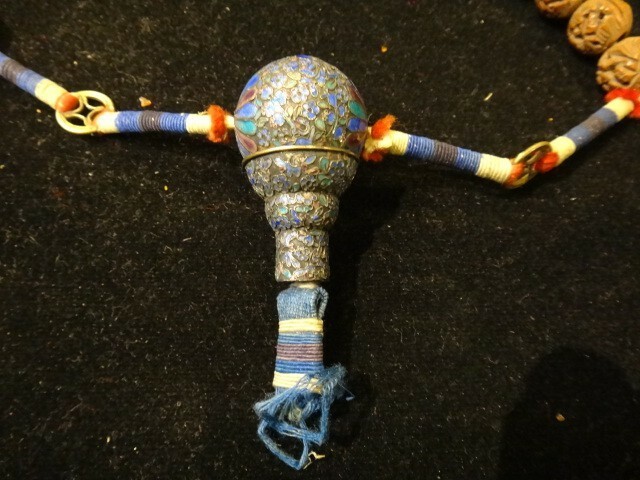 I found these beads in an eBay auction, badly re-strung on tiger tail, but apparently preserving the original assemblage and composition, which presumably had been strung on knotted silk that rotted over the decades. The oval pink glass beads, sometimes referred to as "starburst" or "galaxy" millefiori have been identified as products of a glass factory in Boshan, China, probably from the 1920-30s, possibly produced under Japanese management. The crystal and black faceted pressed glass rondels are typical European beads often seen in necklaces from the 1920s-1930s. Thus, this necklace might have been made in the years between World Wars 1 and 2. Here's an example of what appears to be an intact necklace from the Deco era featuring this style of twisted wire openwork cloisonne beads and green glass crumb beads often referred to as "Peking Glass." The silver clasp is especially charming, with its classic Chinese combination of "squirrel and grapes." Subsequently I located another set of this type of cloisonne bead - the outer ring of beads in the photo below. However, the beads from the necklace are perfectly matched and more precisely crafted, as the photos below demonstrate [necklace beads are on the left]. Also note the different different positioning of the end caps pattern against the circumference pattern. What exactly do I mean by “twisted wire” cloisonné? The piece is only fired to melt the enamel, which is not ground or polished. Tsarist Russian enamellists favored this technique for their intricate and beautiful products. Possibly because it can be a more abbreviated and less labor-intensive technique, it’s still in wide use in China today for fashion jewelry beads and trinkets. Contemporary enamels – which may be epoxy resins as well as glass enamels – appear in transparent jewel-like tones as well as pastel colors resembling fondant frosting. Recent Chinese beads purchased on eBay from trhenning. Hi Chris, loving your new blog. Very pretty pieces on there.